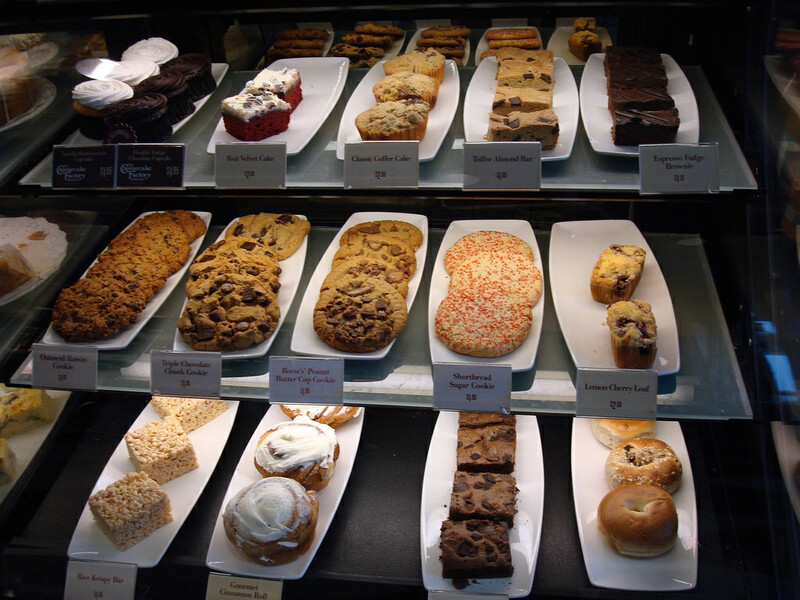 Starbucks can be a healthy eater’s best friend—or worst enemy—depending on what you order. We’ve scoured the menu and pored over the nutrition facts of all your favorites so you don’t have to. 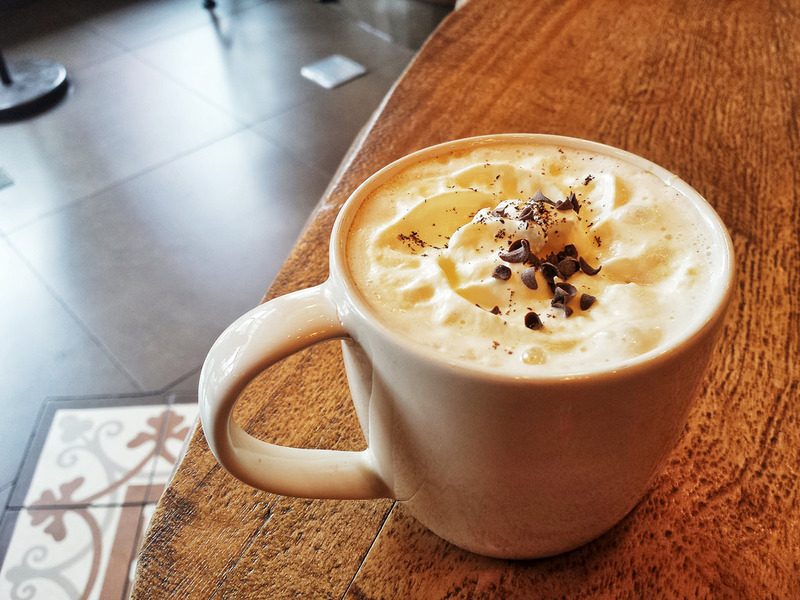 One of the best things about Starbucks is that you can find one pretty much anywhere and the drinks and food are dependably good across all the locations. Chances are you drive or walk by the iconic green sign somewhere along your commute, and this means a delicious and reasonably clean breakfast--that is, if you choose wisely. For tea drinkers, opt for a Teavana Oprah Chai Brewed tea or some Japanese matcha (just ask for unsweetened matcha powder mixed with hot water). You can add your own milk and a packet of sugar or honey to the chai and come out way ahead of the classic chai latte. The Sweet Greens and Lemon Evolution Pressed Juice offers another healthy, low-sugar option for your morning beverage. Coffee drinkers, the key is to keep it simple! Drip coffee is always a clean option, but a tall latte or Cappuccino will also do the trick. If you are short on sleep and need the extra caffeine, opt for an extra shot of espresso rather than a size upgrade. One pump of any sweetener (except White Chocolate Mocha, which you really should avoid at all costs 🙅) is typically 20 calories per pump and 5g sugar, about the equivalent of a packet of sugar, though Pumpkin is closer to double that. Adding one pump of your favorite flavor to your drink will taste like a treat without overloading you on sugar. Predictably, all of the delicious and festive sounding drinks pack a big caloric (and sugar!) punch. Pumpkin Spice season may be over, but let it be burned into your brain once and for all that a Grande Pumpkin Spice Latte) has twice as much sugar as an actual piece of pumpkin pie. A Grande White Chocolate Mocha weighs in at 430 calories and a whopping 53g of sugar (more than twice the sugar in a piece of chocolate cake and double the daily recommended amount). All of that being said, the worst thing you can do is overly restrict yourself, which can lead to harmful binges later on. Try opting for one pump of Pumpkin Spice Syrup (when in season) or Cinnamon Dolce (or any of the other admittedly delicious flavors) in your latté, and/or top your latté off with some cinnamon and nutmeg from the self-serve station. This will save you about 20g of sugar, and there will be more than enough festive goodness to satisfy your cravings. The most filling and energizing breakfasts will have a little bit of fat, plenty of protein, and some carbs. One of the perfect meals to hit this trio is the breakfast sandwich. We recommend the Spinach and Feta Breakfast Wrap or the Bacon and Gouda Breakfast Sandwich. If you are looking to eat low-carb, we recommend the Sous Vide Egg bites, which come in egg-white and roasted red pepper, or else with bacon and gruyere. Another great option is the Steel-Cut Oatmeal, which comes with dried fruit, brown sugar, and nuts. We recommend the slivered nuts paired with a fresh banana (sold at the register) coupled with a dash of cinnamon. If you are in a real rush, a decent fallback is a Kind Bar. The Salted Dark Chocolate Nut Bar tastes like dessert but only has 5g of sugar. Starbucks can be a great place to stop for a healthy on-the-go lunch, but the portions are a bit small, so bear this in mind if you did a big workout that day or are generally a big eater. One of our favorite options are the Bistro Boxes. The Protein Box (also a great breakfast option) hits all the right nutritional notes and can definitely be considered clean eating by pretty much any standard. A couple other decent options are the PB&J On Wheat Box (skip the chocolate covered raisins to save on sugar) and the Fruit and Cheese Box. Starbucks sandwiches and paninis aren’t fantastic options, but in a pinch we’d suggest the Egg Salad Sandwich or the Turkey and Havarti Sandwich. Both are heavy on sodium but not disastrously so. Starbucks’ salads are another great option. They are delicious, pretty healthy, and pretty affordable at around $7 each, but the salads may not fill up a big eater for very long (approx. 400 calories each). Our favorites are the Zesty Chicken & Black Bean Bowl and the Hearty Veggie and Brown Rice Bowl. The sweet snack display is oh-so-tempting, but try to stay strong! If you are feeling an iced drink, we recommend unsweetened iced tea with a splash of lemonade or a pump of peach—these are low in sugar and high in taste! Sweater weather got you craving something more cozy? Go for a simple hot tea with a splash of milk and/or honey. Need an infusion of caffeine to beat the afternoon slump? A simple Iced Coffee or Cold Brew with 2% milk, almond milk, or coconut milk should hit the spot. Getting one or even two pumps of flavoring or sweetener makes this taste like a treat but still puts you far ahead of a mocha or a Frappuccino in terms of calories and sugar. Most of the Starbucks smoothies only contain fruit and milk or Greek yogurt, along with whey protein, but many of the smoothies still clock in at over 50g of sugar! 😱 A healthier alternative would be a secret menu item called the Blueberry Protein Smoothie. Grab a pack or two of blueberries from the refrigerator case, hand it to your barista and request a custom drink to be made by blending the fruit with whey protein, ice and either water or milk. Another solid secret menu option is the Espresso-Banana Protein Smoothie, which is whey protein, a banana, a shot of espresso, ice and water. If you are looking for a snack, think about grabbing some nuts at the register. Craving something sweet? You don’t always have to say no—and you shouldn’t! Restricting yourself too much can lead to failure – satisfy your sweet tooth with the adorable Petit Vanilla Bean Scone for just 120 calories. Craving a special treat? Treat yourself, but order it in a short cup. Any drink on the menu can be ordered as a mini. That S’mores Frapp is a lot less sinful when it’s only 10 ounces (though still 230 calories and a whopping 31 grams of sugar). If you are looking to cut calories but aren’t ready to go for a straight espresso shot, try replacing your latte with a tall cappuccino and sprinkling some cinnamon and nutmeg on top for only 90 calories. 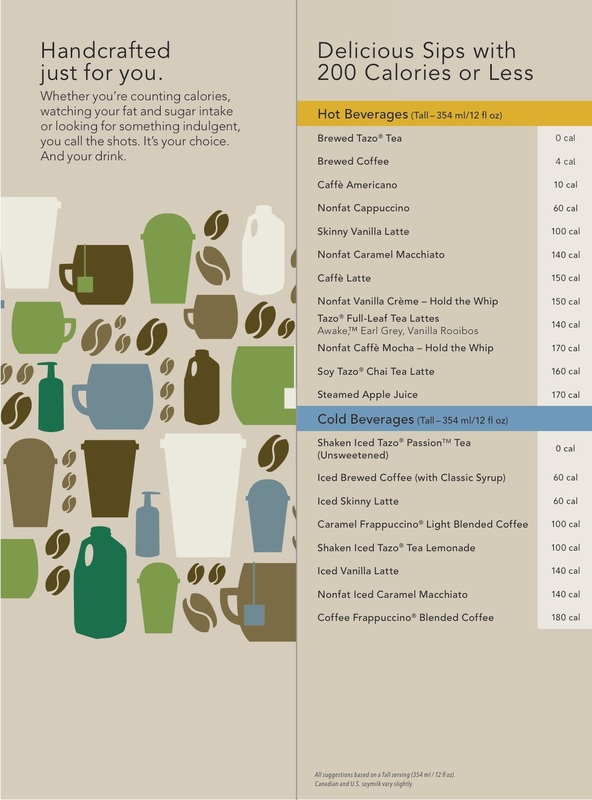 You can find complete nutritional details in this handy infographic from Starbucks here or else on their online menu search feature.